Studies how cells sense and respond to mechanical forces. Cells are constantly subjected to mechanical forces that originate either externally from the environment or internally from cellular machinery. The Alushin lab studies how cells use changes in the conformation of actin filaments within their internal skeletons to sense and respond to those forces. Over the long term, his group seeks to understand how changes to actin are linked to alterations in gene expression in development and disease. Cells are supported by a cytoskeleton made of protein filaments that provide it with an internal structure and facilitate movement. Microtubules and actin are two of the predominant classes of filaments, and each has distinct roles. For instance, the intrinsic dynamics of microtubules drive cell division by separating duplicate sets of genetic material, while those of actin filaments power cellular movement. Both types of filaments additionally interact with hundreds of binding partners and serve as tracks for molecular motor proteins, providing the infrastructure for organizing and shaping the cell. Alushin studies how these filaments, themselves macromolecular assemblies composed of repeating protein subunits arranged like steps in a spiral staircase, physically interface with collaborating proteins. To investigate these interactions, Alushin employs cryo-electron microscopy along with biochemical and biophysical approaches. During his doctoral studies, he and his colleagues produced the then-highest resolution images of microtubule structures. His graduate work also explored the basis for microtubules’ dynamic growth and shrinkage, as well as structures that attach chromosomes to microtubules to position them during cell division. Alushin’s lab now focuses on actin’s contribution to cellular mechanosensation. Previous research suggests the pushing and pulling forces generated by a cell’s environment and its movement may cause actin subunits to change shape. To investigate these changes, his group is developing a novel approach to reconstruct and visualize deformations of the filaments at a structural level as they are pulled in opposite directions by myosin motors. 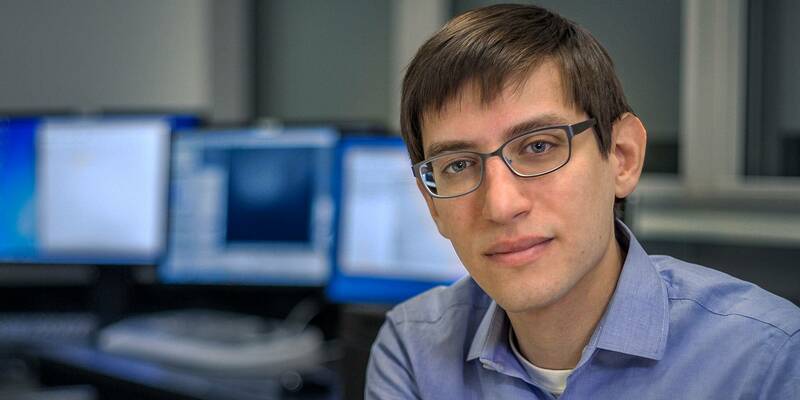 Alushin hypothesizes that cells gather information about the forces they are experiencing by “reading” these structural changes, and his lab seeks to identify the actin binding proteins that act as sensors to detect these changes. These sensors are believed to transduce mechanical forces into signals that prompt responses from the cell, such as migration or differentiation. Alushin is using cryo-electron microscopy to further define the interactions between actin and its many binding partners in order to better understand the context in which these sensors work. Taken together, Alushin’s studies support a broader goal: to understand the means by which mechanical forces influence both a cell’s characteristics and its behavior. Short-term exposure to mechanical force can prompt cells to migrate, or, in the case of cancer, metastasize. Over the long term, meanwhile, forces can alter gene expression, causing new cells to mimic an existing environment. Alushin’s long-term goal is to explore this link between sustained mechanical forces and gene expression. Alushin is a faculty member in the David Rockefeller Graduate Program, the Tri-Institutional M.D.-Ph.D. Program, and the Tri-Institutional Ph.D. Program in Chemical Biology. Gurel, P.S. et al. Cryo-EM structures reveal specialization at the myosin VI-actin interface and a mechanism of force sensitivity. Elife 6, e31125 (2017). Kim, L.Y. et al. The structural basis of actin organization by vinculin and metavinculin. J. Mol. Biol. 428, 10–25 (2016). Alushin, G.M. et al. High-resolution microtubule structures reveal the structural transitions in αβ-tubulin upon GTP hydrolysis. Cell 157, 1117–1129 (2014). Alushin, G.M. et al. Multimodal microtubule binding by the Ndc80 kinetochore complex. Nat. Struct. Mol. Biol. 19, 1161–1167 (2012). Alushin, G.M. et al. The Ndc80 kinetochore complex forms oligomeric arrays along microtubules. Nature 467, 805–810 (2010).